In 2011 I finished my 14th Ironman at Ironman Louisville and haven’t done a triathlon since. With the coming birth of kiddo number 2, I needed to simplify my life for a while. I did less training and more exercising in the early months after Cooper was born, but eventually found myself doing more and more trail running. What had been an interest grew to a borderline obsession and eventually I was training to race again. I completed a challenging 50K run and finished off the 2012 season with the 50 mile Bear Chase run in Lakewood. Even in the offseason I was still doing a 20-30 mile run every weekend and looking forward to an even bigger year in 2013. I was evolving from an Ironman distance triathlete to an ultra runner. Well, all that running caught up to me and in early January I developed a stress fracture in my upper femoral neck (the part of the bone that sits in the hip socket). It was painful. I absolutely couldn’t run. I walked funny. I couldn’t swing the kids around. I was stuck. What to do? I could swim with no pain and so I did that. In early January I had been swimming once per week bagging an uninspired 2000 yards or so per swim. It took a few months just to be able to swim hard on consecutive days, but the yards started adding up and I began to feel I should get something for all the effort besides dry skin. 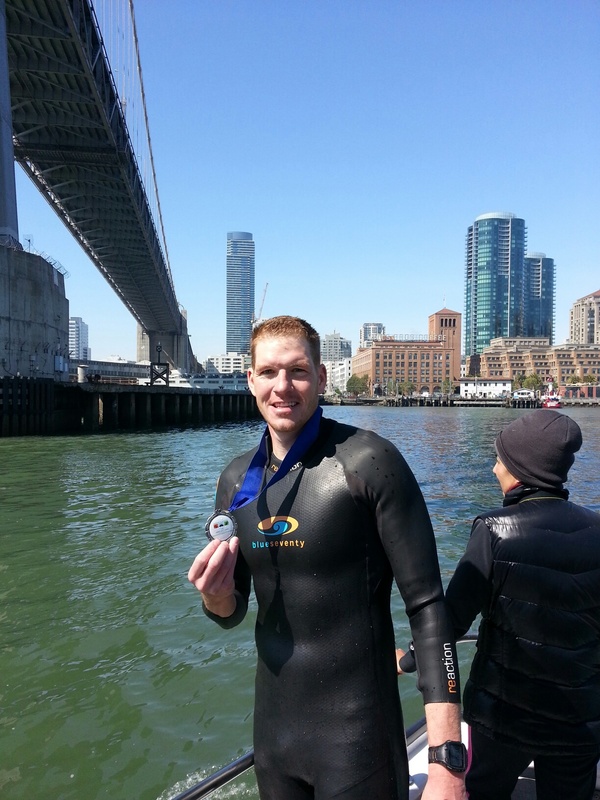 I delved into a new world…the world of open water swimming. I had only ever been a swimmer as part of being a triathlete. To be honest, I had always been a pretty capable and confident triathlete swimmer, but I had never considered myself to be a true “swimmer”. If you are a triathlete, you always have a built in excuse if you don’t swim well….you’re training for 2 other sports! As soon as I start signing up for swim races, I need to step up my game. Searching open water race calendars and forums was a little weird at first. I settled on the Bridge to Bridge race as my first race because the distance would be new to me and I knew the San Francisco area. 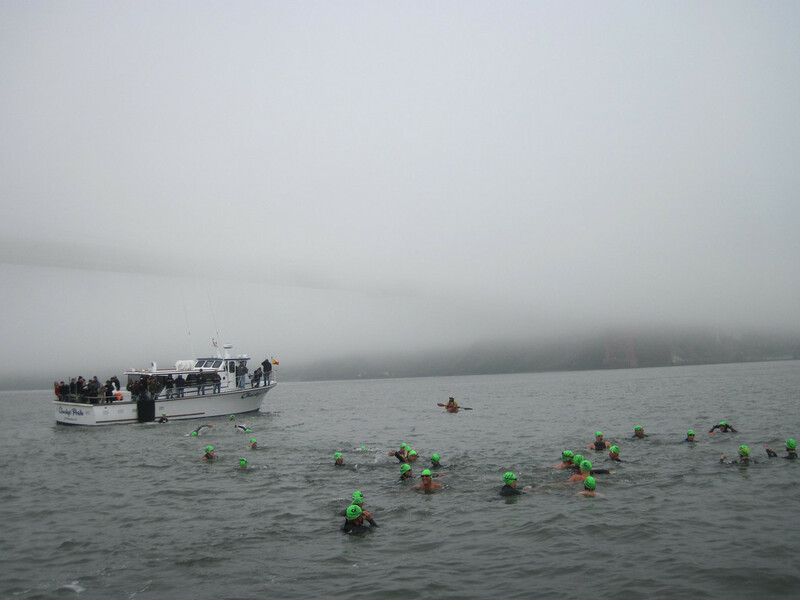 The swim was 10 kilometers long and started at the Golden Gate Bridge and finished at the Bay Bridge. It would be cold and there would be currents. My training added up and my weekly long swims got to, and then beyond, 10K. This was all a little different. Map. 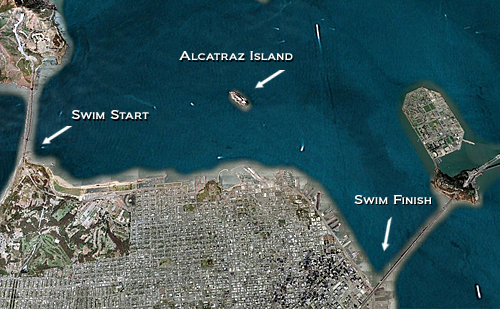 First we had to swim towards Alcatraz. Then we hug the coast. I was nervous about the water temperature, the currents, the distance and even a little about sharks and seals. I dropped by a Swimming and Boating club near Aquatic Park for a practice swim the day before. The gentleman who checked me in asked what the race’s “warming strategy” was for after the swim. I just shook my head and fumbled through a confused response telling him we were just told to bring warm clothes. He gave me a disappointing look that instantly made me feel unprepared. Warming strategy? What is that?? Oh my goodness. I am in trouble! I got in the water and was briefly overcome with panic when my face first hit the cold water. Much of the panic was driven by nervousness, but I really was concerned I might not make it long in the water on race day. Exiting the boat and swimming to the start line. The morning of the race I hopped on a boat that drove us out the base of the Golden Gate Bridge. I pulled on my wetsuit, neoprene cap and my goggles. At the very last minute I jammed in some earplugs that they passed out which were supposed to keep the cold water out of your ears and prevent any headaches. I didn’t really like trying something new on race day but I figured it would be easy to pull them out if they bothered me. I was one of the last few people to jump in the water. The initial blast of cold water was certainly an attention getter, but the wetsuit took the edge of a real painful entry. I slowly made my way to the start line….a little too slowly I guess because the starting gun went off before I could get there! From about 20 yards behind, I starting playing catch up. There were definitely some swimmers easing into the race. I saw lots of backstroke and breaststroke as folks adjusted to the water temperature. My plan was to start out pretty hard mainly so I could quickly warm up and to keep my mind distracted from feeling cold. Pretty quickly I was towards the front, but it was very foggy so I couldn’t tell for sure who was ahead of me or where I was going quite frankly. The race started during a slack tide so there wasn’t much current, but eventually it would start to push us forward. We had been advised to spend 20 minute swimming left (seemingly off course) towards Alcatraz Island to avoid getting caught in an ebb tide near the shore off to our right. Swimmers stuck there would need to be “repositioned”. 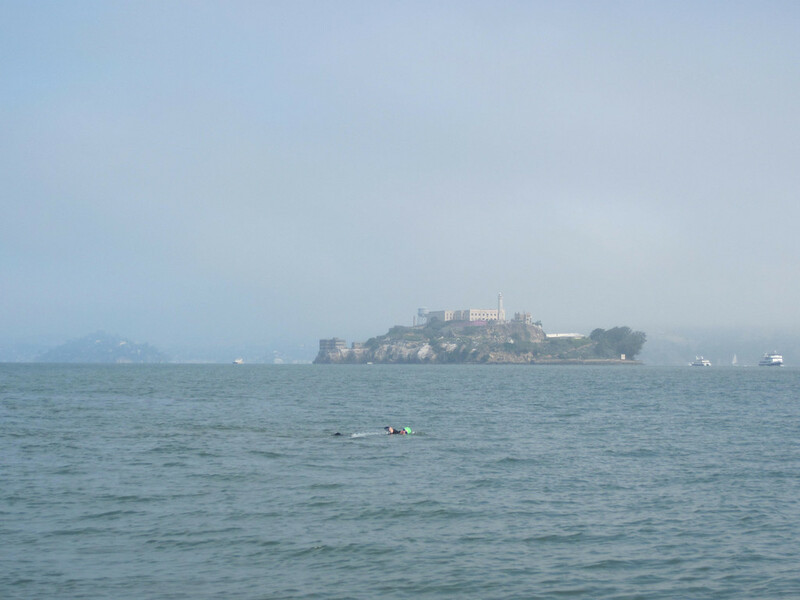 I followed a goateed fellow swimmer out towards Alcatraz until a kayaker advised us it was time to start headed back towards the shore. I had seen one swimmer just ahead of us off to our right, but I lost them. I figured we were either 1st and 2nd or 2nd and 3rd. I don’t know what typical conditions in the Bay are, but on this swim it didn’t seem any worse than I had been prepared for. There weren’t really any winds and other than the low thick fog the conditions seemed pretty good. There was a chill in the water but it didn’t bother me in the least while swimming. At one point I was even wishing I didn’t have the neoprene cap on because I felt warm. The pace of the guy I was following seemed slow so I tried a few times to pass and realized it wasn’t as slow as I thought! I settled back in behind him. For reason known only to God, I kept slipping back and not taking full advantage of the drafting opportunity, so I was probably working almost as hard as he was. It all started to catch up to me about 45 minutes into the race when it became increasingly difficult to stay with him. I started to feel better around the 75 minute mark and was thinking of trying to pass him when we hit some serious chop. Swells lifted us up and dropped us just as quickly. My long even strokes became disorganized and I got separated from my companion swimmer. After 5 minutes or so the water calmed down and my swimming mate was about 20 yards to my left. As we rounded a corner and came back on the same line he was now about 100 yards ahead of me. He may have swam faster or got a better boost from the current. It didn’t really matter why, the end result was that he was ahead of me. After we made that turn the Bay Bridge came into view and it was quite a sight. Being at water level the bridge seemed oversized and spanned the entire horizon. The fog had finally lifted and the sun peaked her head out to light up the city and the bridge. I actually took a brief moment to take it in. Over the last 30 minutes I tried to catch up to the guy ahead of me and I’d make a little progress here and there, but never got close enough to feel I had a chance. The current started to pick up a bit as I neared the finish at the bridge and between that and kicking hard for home, I was moving!! I swam 20-30 feet away from a huge docked cruise ship which was awesome and terrifying at the same time. I had thoughts of the huge propellers firing up and blowing me away! The final push to the finish buoy seemed to take forever. The bridge is huge so even from far away it feels like you are pretty close. I probably had 4-5 all out efforts to get home only to realize I started too soon and was crushed. I’d recover and make the same mistake all over again. I finally reach the buoy for a 1:48 swim time and swam over to the finish boat to a hearty round of applause from the spectators. I was 3rd overall and completely ecstatic about it. It’s easy to look back and say “of course I could finish”, “of course the cold water wouldn’t bother me”, “of course the currents wouldn’t shoot me off course”, “of course I’d finish well”, but going into it I really feared the opposite of all of those things, so there was a genuine satisfaction there. Outside of some serious chaffing from my wetsuit around my neck I came out feeling great and ready for the next challenge. I have just begun to run very very short distances again, but I’m still a ways from off from feeling like a “runner” again, so for the near future I will continue to masquerade as an open water swimmer. Next stop is a 12 mile swim around Key West in June which will be a 35 degree difference in water temperature Out of the icebox and into the firebox! Onward, the next challenge awaits. Kayakers wait at the start. Golden Gate Bridge in the background. After swimming towards Alcatraz for a while, we turned course back towards the city. With currents, sometimes the shortest distance between two points isn’t a straight line. Swimming by more stuff around the 7K mark. After a right hand turn, the finish line (Bay Bridge) comes into view!! But it’s still so far! Swimming right by this cruise ship was a little unsettling. We are swimming to an orange to the left of the first tower. Got this trophy and this cold beer!